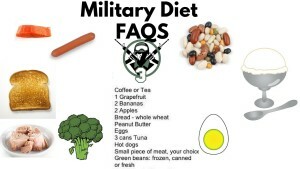 The 3 Day military diet is a strict eating regiment of 3 days. On days 4, 5, 6, & 7 you eat normally, preferably with a slight calorie deficit. You have questions. We have answers. Some answers anyway. 1 Can I really lose weight on the military diet? 2 Why are hot dogs and ice cream part of the Military Diet? 3 Why is Water so important on the Military Diet? 4 Can I drink as much water as I want? 5 Can you have snacks on the Military Diet? 6 What do I do with the Military Diet Four Days Off? 7 What are Military Diet Side Effects? 8 Can the Military Diet work for vegetarians? 9 What sort of Exercise Should I do? 10 What about Alcohol during the Three Day Military diet? 11 Can I do the 3 Military Day Diet for more than 3 days? 12 How much weight will I lose on the 3 day military diet? 13 Can I substitute one food for another on the diet? 14 Is the 3 Day Diet safe for Diabetics? 15 Is this diet safe for children and teens? 16 What are the Risks of the Diet? 17 What are the Other Names for the Military Diet? 18 What is Dieter’s Fatigue? Can I really lose weight on the military diet? Yes. You can probably lose weight on any crazy diet. If you take in less calories than you burn then you are guaranteed to lose weight. The military diet seems crazy to some. There are others that like the structure of the diet but really have problems with the hot dogs and ice cream. They don’t know why but they think you shouldn’t eat hot dogs or ice cream. Ever. All the foods on the diet are important. The three days you are on the diet have a great balance of the nutrition your body needs. The diet is low calorie but the foods keep you with enough energy that you don’t have to survive on sheer willpower. Everyone is different and the diet doesn’t take into effect your body size or metabolic rate. It’s a one size fits all. And most feedback on the diet has been really positive. Why are hot dogs and ice cream part of the Military Diet? If you ate nothing but ice cream you would have some real problems. When ice cream is part of a diet plan it can supply nutrients the body really needs. Ice cream has an abundance of calcium for bones and teeth not to mention phosphorus. Ice cream also has blood-pressure-lowering potassium and energizing B vitamins. We don’t want you to eat a lot of ice cream. But we don’t want you to eat nothing but broccoli either. Why is Water so important on the Military Diet? Well….each day humans must consume a certain amount of water to survive. Of course, this varies according to age and gender, and also by where someone lives. Generally, an adult male needs about 3 liters per day while an adult female needs about 2.2 liters per day. Some of this water is gotten in food. Secondly, it is the universal solvent, meaning that other substances regularly and easily dissolve into it. This allows water to carry nutrients to cells, and carry waste away from them. Energy drinks are the devil. The jury is still out on caffeinated beverages and their health “benefits”. I think we’ll see a lot more of the negative effects of caffeine come to light in the years to come. Also coffee can interfere with weight loss. Juice and teas interfere with weight loss. Water is about the best thing for you when trying to lose weight. Can I drink as much water as I want? Can you have snacks on the Military Diet? No you cannot. The obsession with snacking is to help you get from meal to meal. Most the time snacking just trains your body to always be hungry and to always be taking in food instead of burning off fat reserves. Some snacks can be good and will help you with your diet. These snacks are rare and most of the time will only make the dieter more hungry. Mindless snacking, on the other hand, can easily bump you over your allotted calorie requirements while providing little nutritional help. This type of snacking can contribute further weight gain and to the ultimate development of a diet related health problems. Snacking might be the main reason we need to lose weight in the first place. Many times we snack out of stress, habit, boredom, or frustration rather than out of hunger often leads to weight gain. Our ancestors didn’t eat 3 meals and day and certainly didn’t snack their way through the day. Snacking is fun and is big business in the developed world. But the truth is that it will likely take you over your daily calorie budget (even when not on a diet) and result in excess weight. Many popular snack foods are super calorie rich and simply aren’t good for you. What do I do with the Military Diet Four Days Off? First figure out our Basal Metabolic Rate. If you are an active person or someone that plans to be more active you might want to figure out your Harris Benedict Equation. Simply put it is a formula that uses your BMR and the amount of calories you use throughout the day to figure out how many calories you will use throughout the day. The equation works well except for those very muscular (will under-estimate calorie needs) and the very fat (will over-estimate calorie needs). After you figure out how many calories you need to sustain your day-to-day functions you simply eat those calories. It’s important not to eat more. If you need 2,000 calories a day to sustain your body weight then eat only those 2,000 calories. On the military diet four days off our goal is just to maintain our weight not to lose more. There are aggressive dieters that will start the diet over every 3 days. There are some that work out hard on the military diet four days off. And there are others that go calorie negative on the military diet four days off. We don’t recommend this. Working out is great and we understand the desire to shed weight quickly but we don’t want to burn-out on the diet. The leading cause of diet failure is diet fatigue. The 3 day military diet is powerful enough without trying to overdo it. Just eat normally. Avoid snacking. And keep your sugars low. The weight you see melting off of you will be motivation enough. What are Military Diet Side Effects? The Military diet side effects we see most are those on the diet roller coaster. But this is simply because they have not followed the diet. The bulk of the weight loss will occur on the 3 days you are on the diet. But if you binge on the military diet four days off then you will have reverse the weight loss you accomplished. The longevity of the 3 Day Military Diet and the fact that it is made of simple, cheap food makes it relatively harmless. It is made up of regular food without any expensive or harmful diet supplements or drugs. The other military diet side effects can be body fatigue, headaches or light-headiness. This is probably from the more extreme form of the diet. You should never get down to 500 calories on this diet. But if you are feeling sick on the diet it would be best to consult your physician. Can the Military Diet work for vegetarians? The military diet works great for vegetarians. We don’t recommend substitutions for the 3 day military diet except in the case of dietary restrictions or allergies. Consult the substitutions page for meat substitutes. There are also substitutions for vegans, gluten-intolerant, and others that are allergic to nuts. Because of the low number of Calories in the diet, exercise should low intensity. Walking is great while on the diet. Other low intensity workouts like tai-chi, swimming, yoga, etc are great! What about Alcohol during the Three Day Military diet? Please don’t. This is a strict diet where you should follow to the letter what is on the plan. Alcohol is not on the plan. You should strictly avoid all types of alcoholic beverages while you’re on the three day military diet regimen. Apart from the water retention that alcohol triggers, and the negative long-term effects, alcohol has calories. A 12-ounce glass of beer has about 150 calories, a 5-ounce glass of red wine has about 125 calories, and a 1.5 ounce shot of gin, rum, vodka, whiskey or tequila has about 100 calories. People who drink alcohol during the diet are cheating on the diet and will not reap the benefits. Can I do the 3 Military Day Diet for more than 3 days? We recommend that you stay on the diet for 3 days. The 4 days off of the diet are essential to keeping your metabolism and energy up. It is also a way to stop dieter’s fatique. You can’t and shouldn’t constantly be on a diet. If you want to start the diet over after your four days of maintenance eating then that is ok.
How much weight will I lose on the 3 day military diet? This is hard to answer because it will depend on your starting weight, metabolism, age, basal metabolic rate, daily activity, etc. Many dieters following the plan exactly, should lose at least a few pounds of fat the first week. There will also be several points of water weight and the fact that there will be less food in the digestive system. Yes it is possible to lose 10 lbs on the first week. Many dieters lose less than that however. Can I substitute one food for another on the diet? The foods you eat as part of the 3 day diet meal plan are put together for a reason. We don’t recommend substitutions but they are allowed if you have to. Is the 3 Day Diet safe for Diabetics? Possibly, but with anyone with a health condition, we insist that you consult their doctors before starting any new diet. Everyone is different and has different nutrition needs. If you have any doubts it is always best to consult your physician. Because of the low calorie amounts and the types of food eaten, this diet could be dangerous for diabetics or anyone with a health condition. Is this diet safe for children and teens? No. A child is still growing and has needs for body and brain development. Restriction of calories is not recommended. Putting a child on a diet could also set them up for potential eating disorders later in life. What are the Risks of the Diet? The three-day eating routine is a strict eating regimen but it almost assuredly won’t that will bring down blood cholesterol levels or the danger of coronary illness due to its high fat content. Despite what might be expected, the eating routine requires foods that are high in fat, saturated fat, and cholesterol; all of which have been connected to coronary illness. The inflexible standards connected with this eating regimen and in addition its calorie limitation place people determined to have dietary problems at danger of a relapse. Anyone with an eating disorder should not take part in this diet! In fact, The University of Minnesota reported in 2007 that pre-adult young ladies are at especially high danger of creating or holding confused eating designs with continuous introduction to magazine or online articles prescribing diets, including the Military Diet. A few nutritionists have communicated to us their worry that when dieters fail to get in shape, or to lose their target weight on the military diet, there is a high risk of “yo-yo”ing and gaining back the weight quickly. We have seen this especially in those that don’t eat normally on their 4 days off. What are the Other Names for the Military Diet? It is probably most famously known as the Cleveland Clinic Diet. The Cleveland Clinic diet is credited to the Cleveland Clinic of Cleveland, Ohio. Whether that is true or just the legend of the diet is hard to tell. There is no official record of the eating regimen’s utilization in the Cleveland office. Many of “famous diet’s” inceptions have turned out to be fairly a urban legend. Numerous varieties of the eating routine and stories of its advancement can be discovered posted by mysterious sources on Web locales and online journals. It is conceivable that the eating routine got to be connected with the Cleveland Clinic in light of the fact that the center publishes specific cookbooks and sustenance guides for persons with kidney issue or diabetes. There are no books or secretly distributed variants of the Cleveland Clinic diet in print, which makes it hard to date this eating regimen not to mention follow it back to its unique source. Albeit a few records kept by the Cleveland Clinic and their advice to consume less calories first started to circle around 1985. The Oregon Health and Science University’s disclaimer about this eating routine expresses that an early type of it called the University of Oregon Medical School diet has been gone around the Pacific Northwest since 1975. The Cleveland Clinic diet has been ascribed to the cardiology bureaus of different healing facilities and medicinal focuses. It’s probable that these offices had overweight patients that were planning on heart surgery and were prescribed the military diet/Cleveland Diet/OHSU diet to help them slim down before the operation. Dieter’s fatigue is when a dieter has tried too hard to lose weight too fast. Putting on weight is a process that takes time. Losing weight is the same. It takes time. Someone that cuts down their calories too low suffers from low energy, loss of mental cognition, and can experience negative moods like grumpiness, light headiness, unhappiness, or general unpleasantness. Dieter’s fatigue can be spurred on by strenuous or high activity exercise. Dieter’s fatigue just about always makes the dieter quit the diet. Normally the dieter will quit the diet and binge on unhealthy food because they think that “diets don’t work anyway” or “I can’t lose weight so why even try?” Diets do work. Many times because of dieter’s fatigue the dieter is in a worse spot (read: fatter) than they were before they started the diet. There are hundreds of diets like the 3 day diet that have worked for thousand of people. The problem is that many try too hard too fast. Simply follow the plan. Eat the meals prescribed in Day 1, Day 2, and Day 3. As crazy as it might seem, make sure you eat your ice cream when it calls for it in the plan. Without the necessary calories (yes sometimes coming from fat) you run the risk of dieter’s fatigue.